Join our founder Karla Constantine and her husband Myron for a 10-day Danube river cruise next Fall! From Prague to vibrant Budapest, this Danube river cruise vacation takes you to four countries. And the scenic beauty along the way as you cruise past quaint towns can be experienced right from your stateroom or while sipping wine atop the Sky Deck of your ship. Includes a tour of the 900-year-old Benedictine abbey Göttweig and a full day excursion to the scenic city of Český Krumlov. 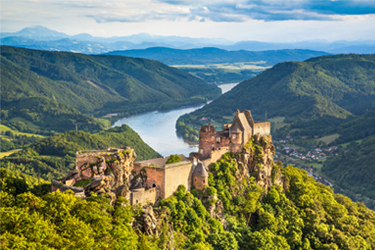 Book Now for Great Price on 2019 River Cruise! 10-day cruise with river-view stateroom. This includes 2 nights in Prague, transfers to ship, 7 nights on board The Envision, all meals, beer and wine at lunch and dinner, excursions at each stop, pre-paid gratuities. Price is per person, cruise only, based on double occupancy. Insurance, and pre and/or post night hotel packages can be added to your vacation at an additional charge. Single supplements are available. $500 deposit per person due at time of booking. Airfare and travel insurance are available at additional cost.